The global soy market is tightening, thanks to a perfect storm of supply constraints. That could send prices higher, creating an opportunity to make money. Soybeans were the top U.S. agricultural export to China last year, worth more than $12 billion. China is the world’s biggest soybean importer, and the U.S. is its second-largest supplier. Yet, there is reason to be bullish about the world’s most popular bean. Drought in Argentina and Uruguay will reduce harvests there. Argentina is the world’s largest exporter of soybean meal, and the third-largest exporter of soybean oilseed. Domestic demand for soy in Brazil could affect its export crop. Brazil is No. 2 in soybean meal exports and No. 1 in oilseed. Soy isn’t just a food source. It is also a source for biofuels, such as ethanol or biodiesel. Brazil raised its biodiesel requirement to 10% from 8%. This bump in renewable fuel will soak up some of the growth in soy. In the U.S., another major soy grower, production isn’t the problem — transportation is. The U.S. ranks No. 3 in soybean meal and No. 2 in oilseed exports. However, heavy flooding affected barge traffic — the main transport routes to ports on the Gulf of Mexico. The risk for American farmers is Chinese tariffs on their soy products. With droughts likely to keep production low, tariffs on the world’s largest soy producer would end up costing Chinese consumers the most. At least for 2018, the outlook is good for soy prices. China has already announced tariffs on 128 American goods. Soy is notably absent from that list. 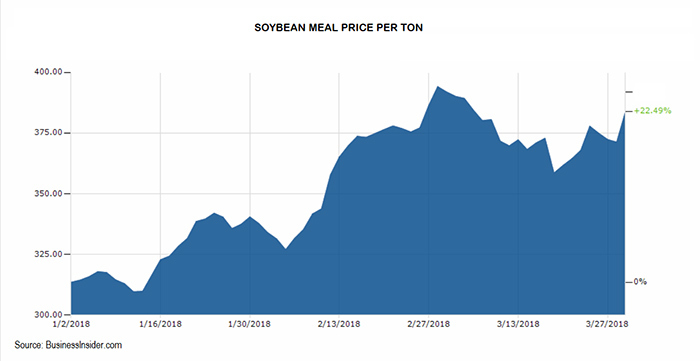 For investors looking for exposure to the soybean market, the Teucrium Soybean Fund (NYSE: SOYB) is one option to consider. This fund is based on the daily changes in future contracts for soybeans.